The structure of a FIBA Europe youth championship is such that players and coaches are under pressure from the first minute. The competition is just two days old and already for Belgium, Czech Republic and Poland it is all over. They are eliminated from the title race and the U19 World Championship qualification but now have to prepare for the dreaded relegation group. In Group A, France secured their Division A status and a place in the round of 12 by beating Sweden (66-50) with a balanced scoring attack. Valériane Ayayi and Marie Mané scored 12 points each while Aby Gaye and Mousdandy Djaldi-Tabdi added 10 respectively. 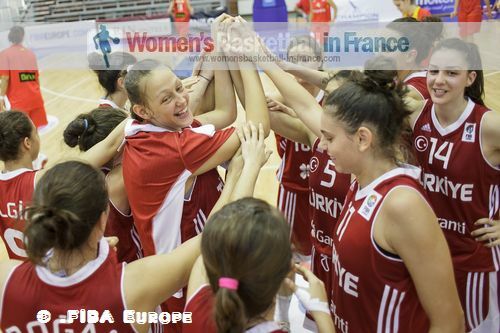 France played to their strength in the paint and picked up a total of 21 offensive rebounds. Sweden's combined total of offensive and defensive rebounds was 31. Sweden made up for the lack of rebounding qualities with high tempo basketball and good perimeter shooting. They edged the first quarter (19-17). But once France moved ahead early in the second quarter Sweden were beaten. France did make hard work of putting the game in the bag. 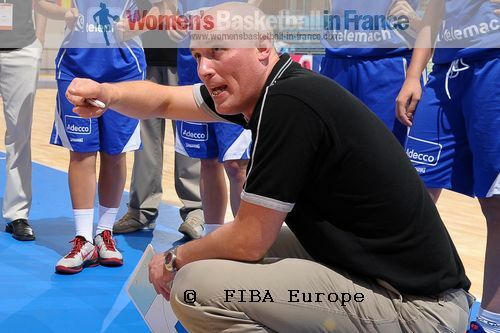 Yet with nobody playing more than 26 minutes, the French coach Jérome Fournier was satisfied. For Sweden Paulina Hersler fired in a game high 20 points. With Spain blowing away Poland (90-51) in the late evening game, the group of death is no more. Poland are eliminated and their final game against France will have no bearing on the rest of competition. France are the group winners and take maximum points into the qualifying round. In Group D, Saso Rebernik (left) the coach from Slovenia has experienced so many highs and lows with the Slovenian youth teams over the years that nothing his teams does surprises him any more. With seven minutes to play in regulation time his team trailed by 14 points and appeared to be heading to their second defeat. 12 playing minutes later he was jumping for joy as Slovenia beat Belgium (58-56). Eva Lisec was the hero with 16 points and 14 rebounds. She also scored the game winning shot. For Belgium Hind Ben Abdelkader was on fire and scored 22 points but it was not enough. With Italy beating Serbia in a cliff hanger match (60-58), Belgium, the 2011 FIBA Europe U18 European Champions find themselves eliminated from the competition. Italy were lucky that Aleksandra Stanacev from Serbia lost her nerve at the free-throw line with a second to play. She needed to hit both to send the game into overtime but did not hit any. All the same Serbia will join Italy and Slovenia in the next round. In Group C, the Netherlands made it two wins out of two with a comfortable victory against the Slovak Republic (63-47). The Dutch team used a clever zone variation that kept their opponents way behind the three-point line which neutralised their long distance shooters. Once again Isabella Slim was the leading scorer for the Netherlands with 20 points. The Slovak Republi'sc leading scorer was Terézia Páleníková. Croatia last won a FIBA Europe U18 Division A game in 2005. So their victory against the Czech Republic (67-41) was celebrated as if they had won the championship itself. Croatia have also secured their place in Division A next season joining the Netherlands and the Slovak Republic in the qualifying round. Turkey are the only team from Group B to have qualified for the next phase of the competition after seeing off the hosts Romania (83-62). The contest was over by the end of the first quarter with Turkey leading (28-7). Turkey took their foot off the accelerator and Romania were able to keep the home fans happy as they chased down the score. In the other game from the group Russia beat Greece (57-45). Albina Razheva was a young lady on a mission for Russia. She scored 20 points in an almost perfect shooting day while also picking up 8 rebounds. Romania can only qualify for the qualifying round if they beat Russia by at least 23 points.